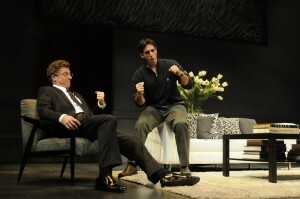 Greg Derelian (right) and David Nevell are two of the four stars in God of Carnage at ICT. When Artistic Director/Producer, caryn desai announced that International City Theatre would be opening its 2012 season with the multi-Tony Award-winning “God of Carnage,” they received thousands of submissions from actors across the country who wanted a chance to audition for one of four enticing roles. One can imagine the difficulty in casting this play with such a bevy of talent available, and yet desai had to look no further than Long Beach to find one of four dynamic actors for the cast. Veteran professional actor Greg Derelian, who won the role of Michael Novak, calls Long Beach “home”. He lives here with his wife and son but has worked all over the country doing theatre and television. With an MFA in Acting from Yale University, it is safe to assume that Derelian knows a thing or two about acting. “God of Carnage” is a caustic comedy about a fight between eleven-year-old boys that brings together their parents to resolve the matter. Diplomatic niceties are observed initially, but as the evening progresses, it deteriorates into a fur-flying hilarious brawl, leaving the couples with more than just their liberal principles in tatters. Shown with fellow costar Leslie Stevens, Greg lives locally in Long Beach, CA but was trained at Yale and has performed on Broadway. Derelian and his three professional co-stars have earned “God of Carnage” rave reviews including a Critic’s Pick from Back Stage and 5 out of 5 stars from the LA Examiner. Share the pride of local talent. ICT is Long Beach’s resident professional theatre company and Derelian is one of Long Beach’s professional residents. “God of Carnage” runs thru February 19. Tickets can be purchased by calling 562-436-4610 or visiting www.InternationalCityTheatre.org. This entry was posted on Wednesday, February 8th, 2012 at 5:05 pm	and is filed under actor, ICT, International City Theatre, live theatre, Long Beach California. You can follow any responses to this entry through the RSS 2.0 feed. You can leave a response, or trackback from your own site.